Let’s face it: guys tend to get the short end of the Valentine’s Day stick. While girls can look forward to jewelry, candy, and a night out, what do you get your man for the holiday? This year try surprising the beer-loving man in your life by getting him a Mr. Beer home brewing kit. Home brewing may sound complicated but the Mr. Beer system makes it easy. Forget the images in your head of large, expensive silos you’ve seen at big breweries; the Mr. Beer kits are simple and practical. Each kit also comes with everything your beer lover will need to make their first batch of delicious brew. With that all they’ll need is some water and basic kitchen utensils and they’ll be all set. You could even read up on our guide to brewing beer so you can lead your new home brewer down the right path even if he refuses to ask for directions. Since it can be used again and again, the Mr. Beer home brewing kit is really the Valentine’s Day gift that keeps on giving. 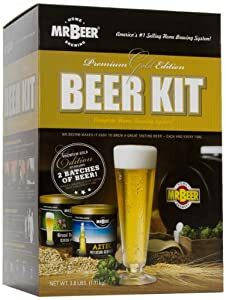 Home brewing is a hobby that is rapidly growing in popularity and gifting your beer fan with a Mr. Beer kit is great way to get them started. Instead of getting your beer fan a six-pack that’ll be gone by the end of the week, why not get them a gift that will indulge their creativity and reward them for their efforts? Not even the finest of craft brews include the sense of accomplishment and pride that brewing your own beer will give you. After their first beer creation is complete, it’s simple for them to get refills of the same brew or try something new. As their skills increase, they’ll even be able to experiment with different techniques and flavors so be prepared to play guinea pig to your new home brewer. Want to really go for the Valentine’s Day crown this year? Imagine how impressed your guy will be when you not only get him a Mr. Beer kit but also nail the perfect recipe for him to brew. Mr. Beer offers several HME’s and hundreds of recipes to fit any taste. Whether your man is an IPA fan or an international lager guy, you can get him a brew he’s sure to love. For some more ideas, check out some of our recipe recommendations that are sure to please. Want to combine two holidays into one? Given the time it takes to brew beer at home, their first batch should be ready in time for Saint Patrick’s Day. Why not try getting him some Irish stout to brew in celebration? The Mr. Beer home brewing kit is a clever and unique Valentine’s Day gift for your beer lover. With its re-usability and variety of recipes to brew, it will also give you gift ideas for years to come. Pick up a Mr. Beer home brewing kit for your beer fan today.